BROWNSVILLE, Texas (CN) – The federal government is taking a cattle-tick eradication program too far, forcing Texas ranchers to have their herds dipped in an insecticide that’s killing cattle, ranchers claim in three lawsuits seeking a combined $1.4 million damages. Tick-borne bovine babesiosis attacks cows’ red blood cells, causing anemia, fever, and an enlarged spleen and liver, according to the Texas Animal Health Commission, or TAHC. Ticks get the disease from the blood of infected animals. Cattle fever ticks, an invasive species, came to the United States on livestock that early colonists brought from Europe. The TAHC and the U.S. Department of Agriculture jointly run the Texas Cattle Fever Tick Eradication Program. “The TAHC was founded in 1893 with a mission to address the Texas fever tick problem,” agency spokesman Thomas Swafford said in an email. The program employs people who search on horseback for stray, tick-infested cows along the Rio Grande from Del Rio to Brownsville, a 500-mile strip of land, running through eight South Texas counties, called the Permanent Fever Tick Quarantine Zone. 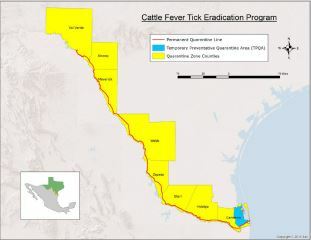 Cattle infested with fever ticks sometimes stray from their herds in Mexico and cross the Rio Grande into the United States, and the quarantine zone is meant to stop the ticks from spreading north into the United States. “The fever tick (actually there are two different species) once ranged as far north as Virginia,” Texas A&M University Corpus Christi animal science professor Joe Paschal wrote in a Feb. 3 article about the arthropods. Swafford, the TAHC spokesman, said “even a small outbreak could be detrimental” to the U.S. cattle industry. “The cost of a relatively small fever tick outbreak outside the quarantine zone in Texas would be $123 million in the first year. … Annual costs for similar sized outbreaks, once capital costs were paid, would be about $97 million,” according to a May 2010 study by Texas A&M University. Juan Delgadillo is a South Texas rancher who raises cattle near the quarantine zone. He brought the federal complaint against the USDA on Feb. 3, seeking more than $1 million in damages for the program he says has killed several of his cattle, and made others lose weight, reducing their value. Delgadillo says in the lawsuit that under threat of criminal charges, USDA bureaucrats are imposing “nonexistent” rules that tick-carrying cattle must be dipped in, or sprayed with, Co-Ral Flowable Insecticide, the brand name of a product that contains 4.2 pounds of the active ingredient coumaphos per gallon. Delgadillo attributes his cows’ deaths to their inhaling or swallowing the insecticide. He says USDA agents refused to consider his request that they hand-spray his cattle instead of bathing them in the substance. Texas and the USDA subject tick-infected herds to intensive dipping: one of three eradication options Texas gives cattle ranchers, according to the TAHC. If a rancher chooses dipping, all the cattle in the herd must be sprayed with insecticide on the ranch or transported to a dipping vat for treatments every seven or 14 days for up to nine months, under the supervision of USDA or TAHC agents. The rancher can instead choose to move their cattle from a tick-infested pasture to a tick-free area, after they are dipped or sprayed, with the goal of starving out the ticks, which are prolific reproducers. Female fever ticks live on their hosts for the ticks’ entire life cycle, only dropping off to lay up to 4,000 eggs on the ground in one go, after they are fully engorged with blood. “The eggs will hatch into larvae, which will attach to animals that walk by, and the life cycle continues,” the TAHC wrote in a brochure. The third option is injecting the cattle with Doramectin, a Food and Drug Administration-approved drug that treats stomach parasites in cattle. Delgadillo says in his lawsuit that the USDA also is damaging his business by withholding documents he needs to show his cattle have been treated for ticks. He sued USDA Secretary Tom Vilsack and Kevin Shea, administrator of the department’s Animal and Plant Health Inspection Service, under the Federal Tort Claims Act. “The losses suffered by plaintiff are the loss (the death) of livestock, the reduction in the sales weight of livestock, the reduction in fertility of his cattle, the loss of normal productivity and weight gain of his cattle, the costs of complying with the wrongful mandates imposed by Defendants representatives, and the cost of burying the cattle,” the complaint states. Delgadillo also seeks damages for the loss of use of land he leased for his herd and for the wages he paid cowboys to herd his cattle to comply with the government’s program. He is represented by Dennis Sanchez with Sanchez Whittington & Wood in Brownsville. Sanchez filed two other federal lawsuits with nearly identical allegations in Brownsville on Feb. 3, against the same defendants, for the Cascabel Cattle Company and South Texas ranchers Luis Ramirez and Santiago Martinez. Cascabel seeks $211,000 in damages, while Ramirez and Martinez seek $226,000. The USDA did not answer several answer phone calls on Monday seeking comment.